A running book with a difference, I was very glad to win this on NetGalley and can highly recommend it if you’re interested in the links between mental health and exercise or want to know more about getting a handle on anxiety. 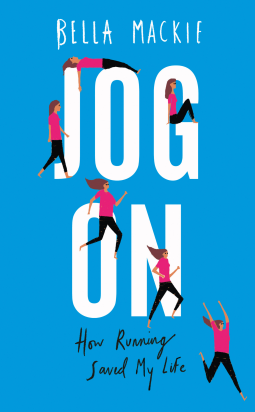 An excellent book, part memoir and part how-to book, about how running helped the author’s quite severe mental health difficulties and can help others’. She usefully explains some of the issues one can face, and is pleasingly robust about post-natal depression not ‘just being a bit of baby blues’ and OCD not being about having tidy cupboards and I loved her honest and forthright style – she felt like someone you can trust, having been there herself but having the insight and self-knowledge to help others while telling it how it is. Mackie’s breakdown and inspiration to start running were triggered by the end of her short-lived marriage, but she had deep-seated and life-limiting anxiety and depression from way before then. By starting running bit by embarrassed and difficult bit (she never, ever makes out it’s easy), she has chipped away at her fears, achieving what she refers to as small moments, for example getting on the Tube for the first time in years, or going through Camden Market. To be honest, I think this is more relatable than some of the big things people take on, and fits with the theme of the book being very personal and non-intimidating. As part of this, I absolutely love how she isn’t a racer, not a marathoner, not a runner who ‘achieves’ some of the things other runners do (she does go to parkrun, though). I know the big racers and marathon runners (even one like me: I don’t like to think of myself as intimidating but I have a friend who was relieved when someone told them at a Run and Talk session that you can stick at 10ks or whatever, you don’t have to run marathons, and I try to remember to mention that now) can be intimidating and put new runners off, so I love this. She shares her struggles and is realistic, and also shares other people’s stories so the range of different kinds of runner is there, but it always comes back to the simple, pure running. By [good runner] I just mean a person who enjoys running and wants to keep enjoying it. Mackie’s portrayal of how anxiety feels is top-notch but she doesn’t allow herself or her readers to beat themselves up over how they feel, act, or have felt or acted in the past. She’s very reassuring. She’s also very honest about how running isn’t a cure-all or an instant cure, and is strong on how we shouldn’t be afraid of using medication and therapy and also talking about that. She’s honest about how running can be another crutch and become obsessive, and bravely shares her own experience, shocked out of her for a lucky escape. She’s all about limiting how much you use it to keep it enjoyable and helpful. From an acknowledgement that running can seem to mimic the symptoms of an anxiety attack (which is so helpful, I think, and also helpful for people to know who work with anxious runners) to an acknowledgement that everybody hates the first 10 minutes of a run, this is a book we can all relate to in some way. With a great resource list at the back, I have no reservations in recommending it highly. Although I finished this book in January, it’s an ideal one to share in Time to Talk week which is all about exercise and mental wellness. Thank you to William Collins for selecting me to read this book via NetGalley in return for an honest review. Does indeed sound like a highly-relatable and realistic book. I think running *can* seem intimidating for us non-runners and even on a small level I’ve found that physical activity (a walk, doing something round the house rather than sitting) helps when you’re not feeling top-notch mentally. I can think of a few people I could gift this to – thank you! Yes, indeed. I work really hard on not being intimidating: the reason I started doing my weekly blog post about my running was to show a fairly normal middle-aged lady trotting around not very fast. I think once people manage to give it a go, it’s often alright – and I never mention I’ve run marathons unless the context demands it or someone specifically asks. And I definitely did RED January to model NOT running every day and a few of the activities I did were fairly minimal. This sounds like such an interesting book and one I’m definitely going to look out for. I had PTSD so anxiety is something I’ve suffered with and while I can’t run, or exercise as such, I do find that keeping as active as I can helps keep my anxiety under control. Thanks for sharing your thoughts on this book. It’s very well worth reading. I’m more on the depression side but have had my share of anxiety and worked hard on it; this book is pretty marvellous. I’ll be interested to read your take on it if you get hold of it.